A fine new American worship leader Darrell Evans, who will be making his UK debut at this year's Cross Rhythms Festival, spoke to Mike Rimmer. Worship music is changing. Here in Britain, we've seen Delirious? and Matt Redman along with a host of others pioneer a new sound. Thoroughly contemporary worship music isn't solely a British phenomenon as we're seeing new things happening in America. Kevin Prosch pioneered it and a band like Sonic Flood or an artist like Darrell Evans are taking it to a new level. Evans has a stunning new album, 'Freedom' and an upcoming appearance at the Cross Rhythms festival so now seems like a good time to discover what is happening. Musically, where British worship has been influenced by Britpop, Evans has embraced North American Stadium rock and says, "I have been influenced by people like Bruce Springsteen or Brian Adams and on the Christian music side Kevin Prosch. On the 'Freedom' record that is me, that's what I do that's the music that's coming out of me! It's a natural thing and I think when a worship leader really taps into who they are and what's their natural flow, whether or not it's the most hip music or the most relevant to the day, people sense there's something honest there. That's what people are searching for the most, something that's honest which speaks to them." Certainly the success of Delirious? in America can't have harmed Darrell's desire to create music that has a raw contemporary feel. He says, "I think it will open it up for many people. I was kind of steeped in the middle of this probably at the same time. It would be interesting to see the full history of them and how the Lord has used them in England with what the Lord was doing here, almost simultaneously although we weren't recording as early as they were. The Lord was taking us along in the States at a similar pace as he was Delirious? and Matt Redman in the UK and what he's doing in terms of revival of worship. When I heard their record it was like a confirmation that we were going in the right direction." Listening to his debut album 'Let The River Flow', it doesn't have the same impact as the joyful vibrant passionate rock'n'roll of 'Freedom1. Evans explains, "The honest truth is that 'Let The River Flow', when we recorded it live, was a bit more edgy and a bit more rock. Of course I'm very acoustic orientated but I like something that's got some zip to it and some passion. But the Hosanna Music people aren't used to quite that much edge and so when they mixed the record, some of that was lost, purposely. I still think it accomplished what it needed to." I suggest that it must have been disappointing for him and he admits, "A little bit. But when we get the cards and letters and phone calls and we meet people as we travel around that have told us that the music has changed their life, then for me it has accomplished what it was to do which was to encourage people to take a step closer in their relationship with the Lord in terms of worship and freedom, and I think it really did that. But sometimes on the musical side it is a little frustrating when you hear something and it doesn't fully come across because they're afraid that their audience might not receive it well. But with 'Freedom', we went for it." The response that Evans received after the release of his debut is certainly an indication that God is doing something new in worship. Even in the midst of his compromise in the sound of the album, he received much encouragement. He explains, "Many prominent worship song writers and worship leaders from around the country told me that it was different from the typical Hosanna sound although it's not as driving as the 'Freedom' record. A lot of these people told me that it almost gave them permission to write like that so I think it opened up a whole new avenue of expression for a lot of worship leaders and songwriters." Evans is filled with hope for the impact of his new album. He confesses his vision, "I hope it stretches the paradigm and concept of what fits in the context of worship, what worship really is which involves an interaction and there is an exchange that happens between us and the Lord. Musically I believe that worship is supposed to be the most passionate and creative music in the world, not the least passionate and creative. Other musicians should be following us, and so I really wanted just to go out there and be something that would lead the way." Evans accepted Christ into his life at age 11 and began writing songs when he was only 14. By age 16 he had begun leading fellow youth in worship. Later, the former Oral Roberts University student went on to serve as youth pastor and worship leader for churches in California, Washington and Oklahoma. 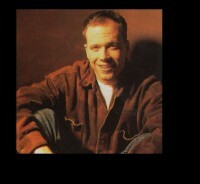 It was while serving at a Vineyard church in Tulsa that Evans made his professional songwriting debut with "Let The River Flow", which was published by Mercy/Vineyard Publishing in 1995. Later, while serving at Open Bible Fellowship in Tulsa, Evans began a relationship with Integrity Incorporated writing songs for the Hosanna! Music label and recorded 'Let The River Flow'. The project later garnered a Dove Award nomination for Praise And Worship Album Of The Year. Shortly thereafter, Evans recorded songs for other Integrity albums such as 'Songs From The Message: The Way Of Love', 'Because We Believe' and 'Our Heart'. Darrell eventually left his position at Open Bible to launch River Flow Ministries, a full time worship concert ministry that is taking him into hundreds of churches around the USA. He also participates in various worship seminars and Christian music festivals. In late 1997, Evans moved from Hosanna! Music to Vertical Music, a newly launched Integrity label created to reflect emerging music trends among teens and young adults in the Church. According to Danny McGuffey, senior vice president/general manager of the Integrity Label Group, "Darrell perfectly represents the audience we want to reach...young people who are looking for more than entertainment, passionate young adults who want to know God intimately and desire music that leads them into his presence." Evans' debut album for Vertical was 'You Are, I AM', released January 1998, an interactive CD that contains video clips, interviews and multi media content plus a mixture of new tracks and tracks originally released on 'Let The River Flow'. But it's 'Freedom' which has made the big impact. Highlights include guitar solos by Vertical Music labe-mate and newcomer Lincoln Brewster, who also contributed vocals on several songs. Darrell is very aware that God is leading the Church into new realms of worship. He comments, "I think He's calling us somewhere, many people don't have a high threshold for change and it can be an uncomfortable growth pattern. I really believe God's calling us somewhere and it involves a renewal of a child like heart. It also means a renewal of an intimate heart and also a heart of repentance and a heart of reverence. All of these things are happening and I think that it's going to spill into our worship, our worship songs and the way that we interact with the Lord. As far as I can see, something needs to be changed if this world is going to come to know Christ. I think worship is one of the greatest draws to the lost that there is." To record 'Freedom', Darrell took his band to a renowned studio. He has fond memories of recording and explains; "We recorded it in Muscle Shoals in Alabama which in the late 60's early 70's was very famous. The Stones recorded in the studios we were in and many other people like Aretha Franklin and so here we are in this historic studio and we even used the same old board that they had in there that Bob Dylan used. So we set up in the studio, just all of our instruments and we played the tracks together! What we determined to do was just let this be a worship event between us and Jesus." Evans did have some concerns about the recording process. He says, "We'd mainly been successful at live events and so the fact that this was a studio recording made me wonder whether the passion of worship would happen there. I also wondered whether the creativity and almost the prophetic type of flow would happen and really it did! The week of recording was like a spiritual growth retreat for all the musicians there and for myself. The Lord really did a lot in our hearts and lives and even one of the engineers from the studio was really touched by the Lord. He came and was a part of some of our morning devotions and I was able to give him a Bible. He said when he heard it was a Christian group coming to record he thought that it was going to be yawn music! But he couldn't believe that we were really letting it rip. He said to us, 'I can't believe I love this.' He was really drawn to the Lord by the passion in it. We had such a great time, the record is basically a recording of our fellowship with Jesus that week and what a great time we had." Darrell Evans will be bringing his exciting blend of rock and praise, enthusiasm and intimacy to the Cross Rhythms festival. The energy of the 'Freedom' album suggests on a musical level that there will be plenty to enjoy but what exactly can we expect from Darrell in a live performance? He laughs, "Well we joke that we don't put on much of a show or performance but what we do is immediately move into being right with Jesus and helping people experience that too. What you can expect musically is just a phenomenal band, the band that played on the 'Freedom' record is going to be there and they're all wonderfully anointed and they love Jesus with all they've got." He continues enthusiastically, "Musically we're just going to let it all go and there's going to be moments of spontaneous music that happens and new songs and good stuff and there will be opportunities to dance before the Lord and shout. There will be opportunities to get on your knees, but we never know exactly what's going to happen except that we're going to go be with Jesus and it's going to be so overwhelming. People who thought they'd never go to that place in worship are going to go there. People who may not know Christ are going to find it's so infectious that they can't help but go on." Strong expectations but then Darrell Evans definitely has something special. Britain hasn't yet experienced it but this American worshipper has dug into the same anointed creative seam that has fuelled the generation stirring songs of the d:boys, Redman, Oakley and others. God is doing the same thing across the globe, inspiring new music and provoking new worshippers to break out into a new place. As for me, I'll be at the festival. I wouldn't miss this for anything. It was by divine providence that I came across Darren Evans music, as I searched, one night, in early July of this year for worship music (vocals) to calm my mind and heart as I was going through a deeply traumatic time, with new heart medication. But, Jesus, the ever faithful One, sorted this out, and mercifully, I am so much better now. Back to Darren's music. He has struck a resounding chord deep within me. I still look out for more of his songs. Previously, even in my alone time, I could not really listen to any kind of Christian music; I just could not connect -- great, beautiful songs and all that, but it all felt like a square peg in a round hole; You know what I mean. Both of us, my wife Valerie, and I are retired. And we cannot just go out and purchase any music, so I remain content with what i can find. I want to know if Darren, his wife (can't recall her name -- a beautiful voice and very talented) and the band still travel on ministry. Or do they now limit themselves to recording, and tours inside the USA? Personally, I wishfully dream of the faintest possibility of Darren, his dear wife, and band possibly returning to the UK, one more time, in the near future. I am certain that the church I am a part of, City Gates Church, in Ilford Essex, (a part of the Elim group of churches) would love to have him minister to God's people here and all over the UK as well. Our son, Joseph Perry is worship director... and would be thrilled if this was possible. And the bonus of a training day for worship bands in the East of London, and even from London, with Darren and his band, doing the training would be a huge asset, and would enable the Church of Jesus to be built up and strengthen in East London, London itself and the UK. I ;will leave it there. i tend to ramble on, on subjects that I get excited about! Darrell Evans: The American songsmith talks about marketing a "worship hit"